...a twist of the knife! FOR COIN & BLOOD uses a modified version of Swords & Wizardry: WhiteBox, but is a complete game. IMPORTANT: ALL ART IN FOR COIN & BLOOD IS BLACK AND WHITE. In order to offer premium paper quality copies, they have to be printed on "color" paper. However, the interiors are fully Black & White. I noticed that in the spell list for Magus includes 6th level spells while the level chart only goes to level 5. I'm just curious about how a Magus is supposed to go about using/obtaining 6th level spells. To get 6th Level spells, the Magus will have to undertake a quest, ritual or something as the Narrator notes. It's there for inspirational purposes. Ah, Understood. Thank you for the quick reply. The game looks fantastic, glad I purchased the hardcover! Also I would like to ask, how well you think this game and other Whitebox-style games are compatible with each other? I’m very interested in learning more about this but the preview still isn’t working. Hi John! DriveThru has said this has been fixed. I've tried on several different computers, and I'm still getting an "Error: pdf document failed to load" message. Hey John. Thanks for following up. I'll see what we can do. Alas, the preview still does not work. We've not had these issues on any of our other titles we've uploaded. In researching it through the back end, we found a setting that was defaulting the preview to the character sheet. That has been changed as of now, and we've expanded the page count of both previews. In trying it in an incognito window in the browser it worked, and after clearing our cache, it worked again. We've also sent another email to DTRPG to notify them of what we've done and ask for any assistance in correcting this, as we're unsure what else needs to be done at this point. If you'd like a preview file from me directly, feel free to reach out to alan@gallantknightgames.com and I will sort you out ASAP myself. If it helps, the error seems to occur with the "Full-Size Preview", not the "Quick Preview" (which is just too darn small to read). We've lessened the page count of the Full-Size Preview on the recommendation of DriveThruRPG. We've been told that it can take a few hours to filter out to the servers, so we'll be checking it in the morning. YAY! The "Full-Size Preview" works! Thank you for getting this corrected! I've tried to view the preview multiple times now and I keep receiving an error in Acrobat saying the file is corrupted. That'd been fixed previously and required a cache clear and refresh. 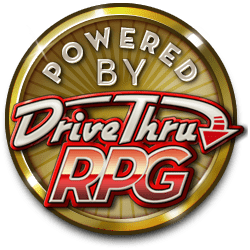 I put a ticket into DTRPG to see if there was a new issue. I am having the issue as well. Same thing, tried Mar 10. Hi Jarad! DriveThru has said this has been fixed. Hi Paul! DriveThru has said this has been fixed. I'm not very happy to see that my kickstarted softcover is completely missing the "Enemies and Opponents" section. I saw your comment on Kickstarter, and I've already reached out to you via Kickstarter Message to address this for you. So just to confirm, if one were to order the Hardcover B&W book, do we get the green faux leather cover featuring just the game title (a really slick look in my opinion)? Or a cover featuring the art of the swordswoman by Alan Bahr (nice art, but I prefer the plain green cover appearing in the KS page)? If you order the hardcover, you get the green faux-leather cover! I stand corrected on the artist. Getting a message saying the preview file is 'plain text' and therefore can't be viewed. Are you referring to the preview? If so, we're working to get it fixed. We're not sure what happened (we've uploaded dozens of products with no issues), so we've had to engage DriveThruRPG. I was, I thought the 'plain text' bit might be useful (I'm no computer geek), and thanks for working on the problem. I'm impatient though and bought it anyway! Hey Raymond, we'll look into it. Thanks, Alan, I'll take a gander.